Wow! I found my Family Tree! For all of us, as an Indonesian, family has a very influential impact in every day life. We are type of people who proud of our ancient culture and heritage, passed from our ancestors to the next generation. We develop the idea of modernity and elaborate it with the traditional thought or idea, the result is something that is really 'Indonesia'. So that is why family has an important role for us. family is the basic institution for human being to learn about life, in other word, family is the first start to begin the real journey on society. I just got back from my father's hometown at Polewali Mandar, West Sulawesi. It has been 4 years since I never step in on that area. Honestly, i don't know much about that place, their people, and their culture. Well, I was born in Dili (East Timor), then moved to West Sumatera and Bali during my primary school years. I could speak several traditional languages of those area, but I never learned about my own father's traditional language. Mandar (his ethnicity) never interested me. I never heard about them from other people, and the lack of information made me so ignorance. That because I was raised in amidst of strong Javanese family (from my mother side) and Minangkabaunese-Balinese environment for a couple years. Until on 2005 for the first time my family brought me to South Sulawesi, the land of 4 ethnic groups; Makassar, Bugis, Toraja and Mandar. So, what's the deal w/ my family tree? On the beginning of the year, my history teacher asked all of his students to work on an assignment to create a family tree. Each of us have to trace our ancestor until 5 generations up. I felt kinda confuse because I don't know much about it and so does my family. My grandparents from both sides already died. And either my dad or my mom didn't remember who was they're great grandfather. But on January 25, my dad brought my mom, me, my sister Nanda and her friend Idha to Polewali Mandar. He planned to take care of our farm-field there and will planted it w/ rambutans/durians trees. Luckily, I found the answer of my assignment here. My father has a big family, and some of them have a book that told us the history of Mandarese. kak Kada, my cousin, also knew about the history of our family. It was so fascinating! I got the list of Mandarese big family bloodline. It's a very long list and kinda complicated, but still fun to be read. Isn't it great when you know that you were the descendant of those people? The list was a copy of the Lontar Version. Lontar is an old traditional manuscripts of South and West Sulawesi culture. Some people treat it with so high respect because it's contained legend, family tree, testament or holy mantras/prayers. 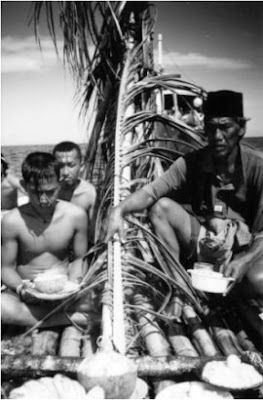 The real Lontar was saved on Tinambung and if you want to open it, you need to sacrifice a goat and perform traditional ceremony. But I was kinda skeptical of my own family tree because some names on that list wasn't clear and there's a blank place that need to be filled. However, the blank place happened because some of the ancient literature wasn't kept properly or the writers by some reason just let it blank. M. Ahlul Amri Buana son of Muhammad Dawasir son of Fatta son of Summaq the descendant of To Tande (a woman) the daughter of I Manyambungi Todilaling Maradia Balanipa I, from the kingdom of Balanipa son of Apasa son of To Ketapa (a woman) a daughter of Ta Bittoeng (a title, literary means; 'Son of the Star') son of To Mepani Bulu (a woman) a daughter of Daeng Lumale. Daeng Lumale's wife is To Metaeng Bose a daughter of Iwello Rate. Iwello Rate is the son of Karaeng Sanra Bone from the kingdom of Gowa and his wife's name is Ipallu, the daughter of Ipaq Dora. Ipaq Dora is the son of To Banua Posi, and To Banua Posi is the son of To Wisse Ditallang and his wife; To Kombong Diwura, the mother of all Mandarese. That's it! I am a descendant of some people with weird name from the Seven Kingdoms of the Downstream (Pitu Baqbaqna Binanga) and the Seven Kingdom of the Head Handle (Pitu Ulunna Salu), 14 old kingdoms that formed the Union of Mandar along time ago. And how about you? could you trace-back your own family tree? Well, I don’t know how to put it rightly, but let me start this writing with things passed-by inside my mind. It’s the second day of New Year 2009, and it’s gloomy. The sky above Makassar rained, and nothing you could do outside. This noon, I was flip-flopping my own mind; whether decided to go to the mosque for Friday Prayer in the middle of windy-rain (I can’t find any ugly slippers. Dad wore mind, and I got some traumatic experience by wearing nice slippers or shoes to the mosque) or just stay calm inside my room and feel guilty to God. But after some tense from my mother and not-quite-inspiring arguments by my sister which forced me to go to the mosque, I went there wearing my broken shoes. No one would steal it, I belief. Today is the seventh day since Israel attacked Palestine and left a massive destruction with so many victims. Most of them are civilians of course, and that stupid Zionist still couldn’t understand the meaning of freedom and peace that every single humanitarian around the world shout to them. This afternoon when I watched TV each channel was giving the same story about the war that is going on. It’s hurt me, it’s hurt millions of soul that knows the story of Palestinian children. I can’t think straightly today. You know, I only have 2 days left from my holidays! Too bad. Then when I come back to school, I’ve to warn myself that we are entering the last semester of school year, which is the craziest, the hardest, the saddest, and also the most stressful. I have made an appointment to hang out with my AFS fellows tomorrow (which is today. Because it’s 12:36 AM already). Tila is coming from Palu and she only has one day to be with us. The fool thing is that I also already made arrangement meeting with Kak Mira and her English camp. I’ll be one of the instructor on that camp but seriously I messed up everything so then I have to meet her tomorrow (which is today) and make up the whole plan. So then everyone could be happy and I could enjoy the rest of the day. Today I got stomachache. Horrible. The best reason to explain it is perhaps because I’ve been eating rendang and pallumara this past few days. Oh yeah, I also have a plan with Agus to join a huge demonstration house by Hizbut Tahrir Indonesia on Sunday. This is gonna be my first demonstration ever! Ha ha, kinda excited. God, I got insomnia again. This is the worst one. It’s all started three day ago. Don’t know why. Maybe because I ate too much rendang without any variation of dishes. Well, all I know is because of this damn wretched trouble sleeping disease, I’ve kinda heard weird voices inside my head (or maybe because I was influenced by the movie Joan of Arc that I watched recently). Gosh, I felt like something corrupted my faith. But I just ignored it. I belief God always be with His good humble servant. And there’s a dozens of more serious problem that my head need to be turned on. People are counting on me. I’m nervous. Uh oh. Final exams! And then the university. Uh! My back is so itchy. My arms and neck also. I think it’s because of the weather. It’s humid, wet, and gloomy. Perfect timing for me to got another hives again. Lord has mercy on me. Well, gotta go to bed right now. It’s 12:49 AM already. I’m alone. Mom and dad are sleeping, Nanda and Rani too, so does Mas Din. Gotta go to bed now. Bye. Kenapa ya, begitu sukar bagi seseorang untuk memahami arti kebebasan orang lain. Apakah kebebasan berpendapat maupun berpikir sebegitu buruknyakah sehingga hal tersebut dapat menimbulkan bencana bagi orang lain? Saya hanya mau belajar, mempelajari apa yang ingin saya pelajari. Karena bagi saya belajar itu adalah sebuah kebutuhan, bukan sebuah paksaan. Belajar itu yang akan membawa kita menjadi ahli di bidang kita masing-masing, bukan justru menjadi penghalang menuju arah yang kita inginkan. Toh segalanya hanya masalah waktu dan kesempatan. Tidaklah menjamin apabila seseorang dengan nilai ijazah sempurna akan selalu mendapatkan semua yang mereka cita-citakan di dalam hidup. Sejarah telah menunjukkan dihadapan kita bagaimana seorang anak gembala yatim piatu miskin di Arabia nan gersang ditunjuk oleh Tuhan Yang Mahakuasa sebagai penyampai risalah-Nya. Anak serupa Einstein yang dulunya dianggap ‘agak miring’ nyatanya mampu untuk menciptakan sebuah teori pencetus terciptanya senjata pemusnah massal yang membuat mata dunia terbelalak ketakutan. Dan bahkan seorang pemuda canggung yang ditolak mentah-mentah dari sebuah akademi seni bergengsi di Vienna, Austria menjelma menjadi seorang Adolf Hitler yang namanya saja membuat merinding banyak orang. Dunia tidak sepatutnya hanya dimiliki oleh satu orang atau sebagian kelompok saja. Hakikatnya, seluruh manusia mempunyai hak yang sama di mata Tuhan, sebagai disebut di dalam Kitab Al-Qur’an bahwa kita ini telah ditunjuk sebagai khalifah-Nya di atas muka bumi. Tapi tetap saja, apa yang dianggap baik oleh seseorang belum tentu pula dianggap baik oleh orang lainnya. Ada banyak pertimbangan. Dan juga banyak paksaan yang diiringi oleh ketidakpuasan. Semuanya merupakan bagian dari hidup bermasyarakat. Oleh karena itu pula kebebasan yang saya permasalahkan di sini pun bak koin dengan dua belah sisi. Tergantung dari mata si pengamat hendak melihat ke sisi yang mana. Seandainya budak-budak Afrika yang diseret dari tanah kelahirannya menuju Benua Amerika dulu keturunan mereka tidak dianggap setara melalui Perang Saudara masa Abraham Lincoln, akankah Beyonce Knowles, Michael Jackson, atau Oprah Winfrey dapat setenar sekarang ini? Seandainya Belanda tidak pernah menginjakkan kaki di Indonesia, apakah Anda yakin kita dapat menjadi sebuah bangsa yang ‘Indonesia’ seperti saat ini? Bukankah dulunya kita ini terpisah oleh ratusan etnik grup dan bahasa serta budaya yang berbeda satu sama lain? Seandainya Soekarno tak pernah lahir, dapatkah kita merayakan 17 Agustus setiap tahunnya? Atau (jika Anda seorang Muslim) bagaimana jika seandainya Anda lahir di tengah lingkungan keluarga Hindu yang taat, apakah Anda akan mempunyai pandangan serta cara hidup seperti yang Anda miliki sekarang?